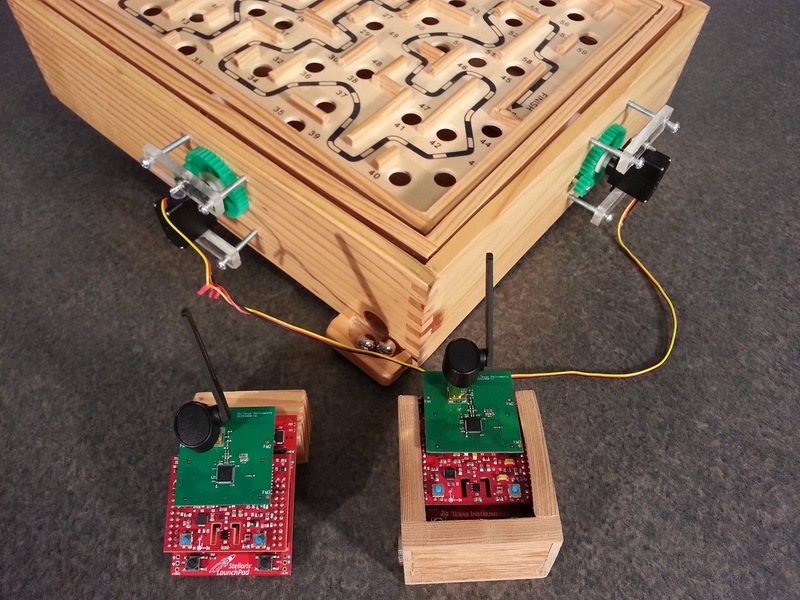 The key piece of hardware that made this project possible was the SensorHub Booster Pack. The booster pack comes with an MPU 9150, which provides 3-axis data from a gyroscope, an accelerometer, and a magnetometer. The communication between the MCU and these sensors is handled with an interrupt driven I2C interface. An additional bonus of using the SensorHub booster pack is that it was designed to contain a set of EM headers. For this project, I connected a CC2533 radio transceiver to those headers, which enables short range radio communication between two modules. It was a bit tricky to set up the CC2533, as there was not a plethora of sample code for using it in conjunction with a Stellaris, but fortunately I was able to find a spare development kit that made learning and debugging the radio interface much easier. Once I procured the hardware, I set about to looking for example code. I came across a project a coworker of mine created, the wireless air mouse demo, that was a great help. The sensor communication was the easiest part to cover (due in no small part to the fact that I’ve spent the past year and change working with these exact same sensors for a different project within TI). TI has a really great sensor library that is available in the current Tivaware C series release that handles a large part of the sensor functionality. The air mouse demo already handled taking the sensor data and feeding it into a direct cosine matrix, which generates the eigenvectors needed to determine the roll, pitch, and yaw of the device at a given time. Once I had this data being reliably generated, I moved on to the radio transmission portion of the code. The radio portion of the project was by far the most difficult. I opted to use the RemoTI RF4CE software stack, because a) that’s what the air mouse demo used, and b) it sounded like an interesting topic to learn more about. The RF4CE protocol basically classifies each node on the RF network as being either a target or a controller, and sets up a very robust algorithm for pairing and sending data between two devices. Unfortunately, the airmouse demo only covered the controller side of the code; for that demo a CC2531 USB dongle was used to handle the target side of the communication, the source code for which I was unable to find. It took a few weeks of reading up on the RemoTI documentation and learning about how the on board MCU on the CC2533 works, but I was eventually able to get a hello world program running, which quickly gave way to transferring roll, pitch, and yaw data from the hand held controller down to the maze controlling target. The servo communication was fairly straightforward: each is controller by a pulse width modulated signal with a base of 20 ms and an active time of between 1 and 2 ms to rotate it to either extreme. I was hoping to use a Tiva C Series Launchpad for this purpose, as it contains a hardware PWM module, but I was not able to find one lying around the lab, so I opted to just use a general purpose timer to create a software based PWM signal for the servos. Once I had roll and pitch data coming over the radio interface, all I had to do was to normalize the rotation between -1 and 1, use that to generate an active time for the PWM, and generate the signal. I ended up adding a multiplier to each axis to get the demo to make a bit more sense, as the launchad is longer along the Y axis than it is the X axis, so it takes a greater effort to change the pitch on the board than it does the roll. 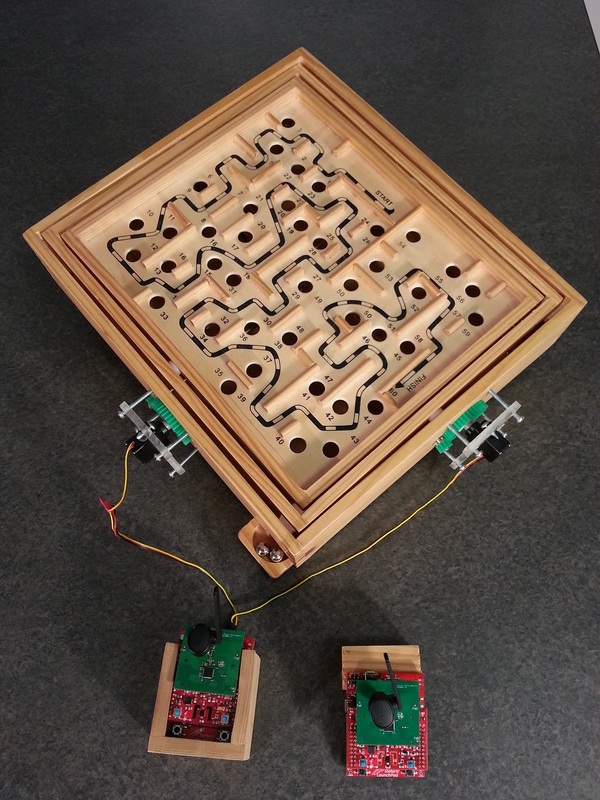 As a result, without a different multiplier on each axis, the controller gave the impression that it required more effort to get the board to move in the Y axis than it did to get the same motion on the X axis. As always, the source code for this project can be found on my github.